Michael Dunlop pictured testing the Buildbase Suzuki at Cartagena in Spain on Thursday. Senior TT winner Michael Dunlop has tested the Buildbase Suzuki Superbike at Cartagena in Spain. As revealed in the News Letter on February 10, the Ballymoney man held an entry for Barry Symmons’ annual Pro Test on the GSX-R1000 and the 15-time TT winner confirmed he was riding the machine on his Twitter account. The 28-year-old took part in a private test at Sepang in Malaysia in February after being invited by Suzuki for a test on the GSX-RR MotoGP machine, raising expectations that he was set to remain with the manufacturer for a second successive season. Dunlop covered himself in glory as he guided the brand new Suzuki Superbike to a stunning victory in last year’s Senior race at the Isle of Man TT, making amends in perfect style after he was forced out of the Superbike race on lap two while leading. 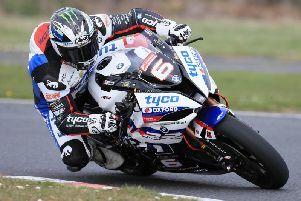 He had been linked to all the major teams, including Northern Ireland’s Tyco BMW squad, and Dunlop created further uncertainty when he tweeted a picture of a BMW S1000RR before setting off for the Spanish test. The TT outright lap record holder also has a CBR600RR Honda prepared by World Supersport concern PTR, which he will run under his MD Racing banner along with his own Superstock machine. Ballymoney's Michael Dunlop celebrates winning last year' Senior TT. However, Dunlop has not confirmed his plans for the season ahead in terms of Superbike machinery. Michael Dunlop tweeted a picture of the Buildbase Suzuki from Spain on Thursday.